Bega Valley Amateur Beekeepers Inc.
October is American Foulbrood (AFB) awareness month and Lyall Zweck and Graham Jones gave an overview of the reasons why beekeepers must be diligent in inspecting their hives for disease. The disease is spread when 6-10 spores are fed to very young larvae. They are most susceptible in their first 24 hours after hatching. Spores are spread inside the hive by cleaner bees trying to remove infected larvae. Invariably spores end up in honey. Bees robbing honey containing spores from an infected weak or dead colony. The Department of Primary Industries (DPI) has advised that in the past month there have been several reports of AFB in the Bega Valley. Cappings partly chewed or perforated. It is important to confirm AFB as signs and symptoms of AFB can easily be confused with European Foulbrood, chalkbrood, over-heated or chilled brood. Accurate diagnosis can be obtained by submitting samples of suspect diseased material to the State Veterinary Diagnostic Laboratory. ABA has worked with DPI to supply a free AFB test kit to every member through local clubs. Pick up your kit at the next meeting or contact Lyall or Garry. It contains a test slide and mailer and copies of relevant DPI Fact sheets. During September/October we want every club member to thoroughly inspect each of their hives by shaking the bees from each brood comb and checking for signs of AFB. As you saw in the latest edition of the Amateur Beekeeper, the ABA wants us to report the number of hives inspected, reporting both clean and infected results. If the colony is AFB affected all bees must be destroyed immediately. The method used will be determined by whether or not you wish to reuse your equipment. If you intend to burn equipment then petrol can be used to kill bees. However, if you intend to reuse then we recommend bees are killed by shaking into a tub or soapy water. This will allow the contaminated equipment to be irradiated. All beekeepers need to inspect their hives early in the season, and to have suspect hives laboratory tested. You can find all the information you require about this on the DPI website. Gamma irradiation services are provided by Steritech in Sydney. If there are a number of members affected the Club will try to coordinate a bulk delivery of equipment to Steritech so that the costs of transport can be shared. Please contact Fay (Club Biosecurity Officer) if you would like to explore this option on BegaValley.publicity@beekeepers.asn.au. Our learning topic for October will be all about Flowhives. Being a member of the Flowhive Beekeeping Support Program means we can obtain direct support and advice from the company. We’ve arranged a Skype hook-up with Cedar Anderson, co-inventor of Flowhive with Stuart Anderson, at our next Club meeting in October. It will include a slide presentation with real time commentary by Cedar, and will give members a great opportunity to ask more about the product and answer your questions. So come along ready to ask him everything you wanted to know about the flowhive. Great results were achieved by a group of 10 students from Bega High School over Term 3 learning the basics of beekeeping, including how to construct hives and working with bees. Beekeeping isn’t for the faint hearted and it was to their credit that everyone had a go working direct with bees. All students were enthusiastic about beekeeping, and some showed a natural talent and interest to the extent that they’re keen to undertake work experience with a commercial beekeeper. At this stage opportunities are yet to be found. Certificate III in Beekeeping has just been added to the NSW Government Smart and Skilled list. As a result, it will soon be available as a school based traineeship. A SBT pilot will commence on the North Coast in the latter half of this year. This would be a major breakthrough for students in regional Australia who otherwise have to move away to undertake a certified beekeeping course. A highlight of the course was the outstanding artistic talent that emerged….as you can see from the amazing mural students painted on a wall at Bega High School, and from artwork on the hives themselves – see following page. The next challenges are much easier! Already we’ve had reports of swarms being found in the district, and the Club will continue to support the program through catching swarms and setting up the school’s 3 hives. A location is yet to be finalised, however discussions are in progress with The Tulgeen Group to locate hives near its nursery in Bega. This has been a great partnership between Bega Valley Amateur Beekeepers, Bega Rotary and Bega High School and we thank all the volunteers and teachers who participated! Unfortunately one of the Club’s hives has succumbed to American Foulbrood and had to be destroyed. The good news though is that the second hive continues to thrive. The Club’s Top Bar beehive is also now assembled ready for installation in the Apiary, as soon as we have some residents for it. This hive, along with the Langstroth and Flow hives, will give club members opportunities to learn about the specific management and maintenance techniques needed to ensure good hive health in different hive styles. Thanks also to Graham Jones, Apiary Manager, and club volunteers who ran the Beginning in Bees Workshops in September. The next Maintaining Your Hives Workshop for people who already have hives will be held on Sunday, 12th November. Rod Bourke, Biosecurity Officer NSW DPI, will lead the workshop. Topics to be covered include finding the queen, re-queening, disease identification and control, preparing a slide for disease diagnosis, splitting your hive, establishing a nuc, combining hives, seasonal management, and feeding your bees. The cost is $60 for members and $100 for non-members. If you or anyone you know is interested please contact Treasurer, Sandy Farrell on 0407 959 312 or by email at BegaValley.treasurer@beekeepers.asn.au. Welcome to our latest new members David Dixon, Deb Nave and Linda Coffee! 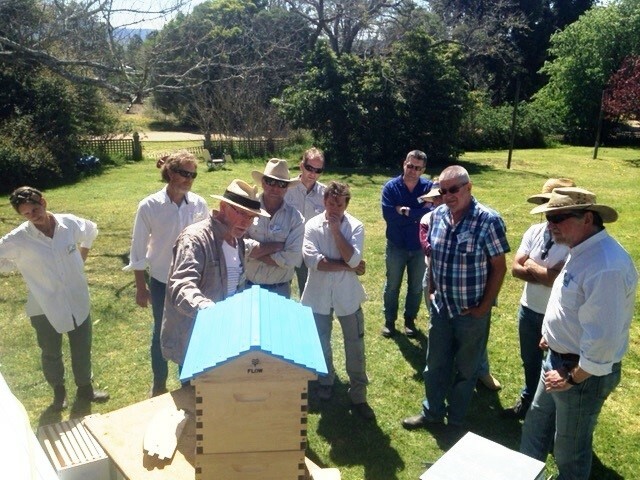 Following successful representation by the ABA, NSW Apiarists’ Association and North Shore Beekeepers’ Association the NSW Minister for Primary Industries Niall Blair has announced that the proposed sharp increase in registration for small scale beekeepers will not go ahead. This great result is due to strong representation by all 3 peak bodies, as such decision would run counter to moves in other states where beekeepers with a handful of hives are allowed to register for free. So what has this to do with biosecurity? We know that the cost of registration can be a genuine burden to some small scale beekeepers, and for those not registered means not receiving important information about beekeeping best practice, biosecurity alerts and treatment – such as the October DPI Biosecurity News. We have two new publications added to the club’s library. They are “The Beekeeper’s Problem Solver” by James E Tew (kindly donated by Will and Karen Blythe) and “Bee Friendly: A planting guide for European honey bees & Australian native pollinators” by Mark Leech. Books are available for borrowing at our monthly meetings and can be borrowed for 4 weeks. Fay’s been pondering whether to insert queen excluders or not….and the decision really comes down to whether you’re managing your hives for honey production, for pollination or simply because it’s interesting – so it’s a personal choice. One thing to keep in mind though is that bees don’t really like to go through the bars of an excluder, and so they won’t – at least at first. A second consideration is the type of excluder – cheap plastic ones are known to cause damage to the wings of bees – so probably best avoided. – see photos. In this case I‘d run out of wire excluders so inserted a plastic one 2 weeks ago while waiting for new metal ones to be delivered – you can imagine my alarm when I found it jam packed with dead bees stuck in the holes…covered by a layer of bees that couldn’t return to the brood box (match stick photo 2 shows scale). You can see some good footage of this on YouTube. Another reason why excluders are sometimes not used is that they can induce swarming. So mine are coming out for the 4 weeks I’ll be away this spring! All contributions to supper most appreciated! Do you have anything of beekeeping interest to share with other members? If yes please send your contribution to Fay at BegaValley.publicity@beekeepers.asn.au. Tim Crisp is the Club Swarm Coordinator, so if you become aware of a swarm in need of catching please let Tim know asap on 0448301220.